Nicolaus Emil Hermann Adolph Ahlers was born in Hamburg, Germany in 1864. His father, Christoph Adolf, was a tallyman in the booming port; he controlled goods being unloaded and stored in the warehouses of Hamburg. Adolph, as Ahlers junior was known, became the representative for a leather belting manufacturers. He came to England some time before 1891, at that date he is recorded on the census as being a single man lodging in a house in Jesmond. By 1901 he had set up home in Whitley Bay. He appears to have prospered; on the census he is married, has two children who were taken care of by a German governess and employs several servants. In 1905 Ahlers was granted British naturalisation; making him and his family British citizens. For the moment, his star continued to be in the ascent as he was appointed the German consul to Sunderland and Seaham Harbour the next year. As consul to Sunderland Ahlers moved to the town and worked out of York Chambers. Newspapers from the period show Ahlers attending church socials and appealing for the return of his lost spectacles. However, his comfortable, rather sleepy, life was about to change radically. In December 1914 Ahlers was tried at Durham Assize court on the charge of high treason. The trial centred on the fact that Ahlers had helped a number of Germans to return to Germany in order to join the army. It was alleged that he did “aid comfort and relieve” the King’s enemy by doing so. His defence argued that Ahlers had been helping men return because Germany had declared war on Russia on 1 August 1914. 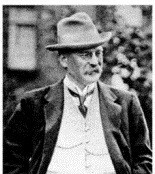 Edward Hale Tindal-Atkinson, Ahlers’s defence barrister and later Director of Public Prosecutions, claimed that Ahlers had not realised that Britain and Germany were at war when he had gave several men money on 4th and 5th of that month in order to get back to Germany. The prosecution was undertaken by Sir Stanley Buckmaster, the Solicitor General. Ahlers was found guilty on December 9th and was sentenced to death. On appeal Ahlers was acquitted and freed, causing rioting and the wreckage of German shops in Sunderland on 21st December. The Times reported that Ahlers left Durham “in obedience to military instructions”. For a few months the Ahlers case fell out of the public eye. Then in May 1915 it was revealed that Ahlers and his family were living in Surbiton under the assumed name of Anderson. Questions were asked in parliament and Ahlers was interned in a “concentration camp” in Islington, the former workhouse, where other Germans were being kept. His wife, Emma, was interned at women’s camp in Aylesbury. Emma appears to have suffered greatly during this period and in March 1917 she was taken to Holloway prison for medical attention. On 21st March it was reported that she was dead. An inquest found that she had taken an overdose of barbiturates and the verdict was “poisoning while insane”. Adolph Ahlers died in 1943 in Hamburg. In April 1919 his naturalisation (and that of his children) was revoked. He returned to Hamburg in May and gave an interview to a local paper which labelled him as a martyr. Three years later he married for a second time and had two further children (one of whom became a journalist for the BBC and a politician). Official documents and even the telephone directories from this period list his profession as ex-consul.